Two competitions have been announced by the British Society for the History of Mathematics. The schools competition invites participants to “make a case for the most important/your favourite mathematician in the history of mathematics” by either writing an article or producing a video or multi-media project. This competition is your chance to explore how mathematics has developed and achieved its status and who were the most important mathematicians in history who contributed to it. This year we would like you to concentrate on choosing one mathematician who has, in your opinion, been the most important person, your favourite, and to make the case for it – to explain his/her mathematics and to show their importance or what you think was special about it and them. This is run with Plus Magazine and there are two categories for ages 11-15 and 16-19. The deadline for entries is 1st September 2019. Guidance, rules, etc. via BSHM Schools Plus Competition. The Undergraduate Essay Competition invites essays on any topic in history of mathematics of no more than 2500 words in length and is open to people enrolled as undergraduates in UK and Irish universities in academic year 2018/19. The deadline is 21st June 2019. Guidance, rules, etc. via BSHM Undergraduate Essay Prize. Were transcendental numbers considered rare, pre-Cantor? What is the history behind the Erdős number? So if you’ve got a burning question about Maths in the Past, there’s now a place to ask it. Imagine, if you will, a group of people who enjoy recreational mathematics and consequently decide that there should be more places for them to share fun maths. It’s crazy and unprecedented, I know, but humour me. What do these three pictures have in common? 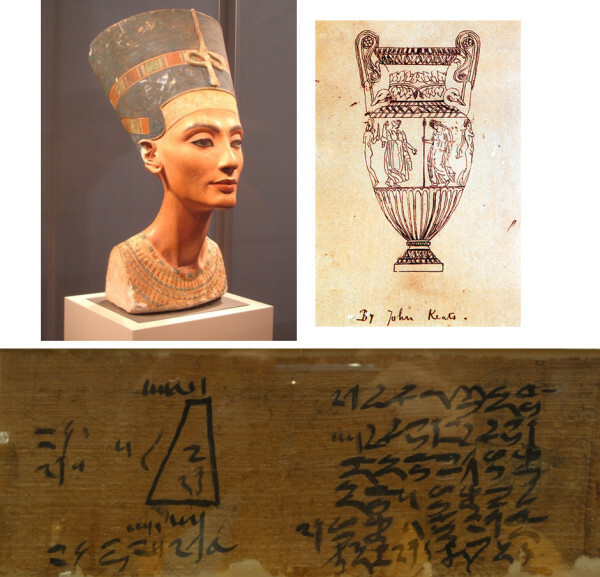 The first is the bust of Nefertiti, an Egyptian queen. The bust is now in the Neues Museum in Berlin and is one of the most beautiful works of art. Nefertiti is translated as “a beautiful woman has come”. The word nefer is in this case translated as ‘beautiful’. The second is a drawing of a Grecian urn by Keats. Keats’ Ode on a Grecian Urn ends with the line “Beauty is truth, truth beauty,”. The third picture is part of the Moscow Mathematical Papyrus from ancient Egypt.